Today’s Young and the Restless day ahead recap for 4/18/2018 was a live recap of the Wednesday, April 18 episode that aired a day before in Canada! The hard-working Soap Dirt team hopes you enjoy this early look at Y&R spoilers. Be sure to read the recap and check us out tomorrow starting at 3 p.m. for the next live advanced YR recap! To make sure you don’t miss a thing, follow us on Twitter and like us on Facebook! Y&R begins today with Sharon McAvoy (Sharon Case) serving Billy Abbott (Jason Thompson) and Phyllis Summers (Gina Tognoni) at Crimson Lights. They all discuss the shocking truth about JT Hellstrom (Thad Luckinbill) attempting to kill Victor Newman (Eric Braeden). Sharon brushes it off as a memorable evening and evades Billy’s questions saying Victoria Newman (Amelia Heinle) hasn’t heard a word from JT. When Billy walks away, Phyllis advises her to keep her answers short and to the point, unless Sharon wants to go down as an accessory to murder. Billy returns and Phyllis wants to ride into work with him to check in on Victoria. Billy is surprised how well all the women have bonded. Nikki Newman (Melody Thomas Scott) is with Victor at the hospital, and he questions her whereabouts the previous night. Meanwhile, at home, Victoria opens a desk drawer and finds JT’s notepad just as the doorbell rings. She is greeted by Paul Williams (Doug Davidson) and another GCPD officer. When she tells him she hasn’t seen JT in the past 24 hours, he shows her a search warrant for the house and grounds. Neil Winters (Kristoff St. John) walks into the office to find his son, Devon Hamilton (Bryton James), trying to get organized. Neil brings up the subject of him and Hilary Curtis (Mishael Morgan) arguing. Neil hopes Simone (Shanica Knowles) was the only woman in his life. Before they can talk any further, Lily Ashby (Christel Khalil) walks in, pleasantly surprised her father is back in town. Lily informs Neil about the new modeling division she is running as he demands answers from Devon. Kyle Abbott (Michael Mealor) meets with Lauren Fenmore (Tracey E. Bregman), who informs him that his father, Jack Abbott (Peter Bergman), is being released from jail. He reveals that Victor named his attacker as JT. Kyle is surprised no one in his family shared the news with him. Lauren says this is a good day for Jack, but there is no way Jabot is going to go public now! Abby Newman (Melissa Ordway) has breakfast with her mother, Ashley Abbott (Eileen Davidson), celebrating that Jack is being released. Kyle calls Ashley and both women are shocked that he is happy about it. Kyle informs them he is having a big meeting at 11 am sharp for a vote on taking Jabot public. Abby and Ashley look at each other frantically as Kyle hangs up to make last-minute calls. Paul tells Victoria that they know JT came back to Genoa City the previous afternoon but they are not sure of his whereabouts from there. She allows them to start the search and tells them where the bedroom is located in the house. Neil is thrilled that Lily joined the family business, but he assumed she was working with Devon on the music side of things. Neil feels that Devon was vague with the information as an excuse to avoid his input. Neil reminds him they are equal partners, even though Devon put up the lion share of the money. They are interrupted by Hilary walking in. Neil is furious that she is another thing Devon didn’t inform him about. Phyllis and Billy arrive to see Victoria, who just wants to make things as normal as possible. She admits that Reed Hellstrom (Tristan Lake Leabu) is furious with her, feeling she drove his father away. Vickie doesn’t have the heart to tell him what really happened with his dad and the abuse. Phyllis and Billy are on opposite sides when it comes to how Victoria is dealing with Johnny and Katie. Suddenly there is a big bang from upstairs and Victoria reveals the police are upstairs with a warrant, searching for anything they can find. Billy picks up the fire poker, both women jump and he asks them if everything is all right as they both gasp. Victoria tells Billy that Johnny was using the poker as a weapon in his ninja warrior games, and suggests they need to find some new toys. Billy hopes Paul finds something that will lead them straight to JT. Billy wants JT behind bars. They all admit that none of them expected JT to end up like this. Billy worries about Reed, but Victoria is confident JT would never harm a child even if he were to come back. Phyllis says Victoria shared a lot last night and she trusts her on this one. Billy is shocked at how tight they are. Paul comes down, taking a few items for forensics. He also found a tablet that Victoria never saw before. Upon closer look, Victoria says it looks like it is her dad’s. Paul wants to take it anyway. As the police leave, Billy and Phyllis’ phones ring. They learn that Kyle is having an emergency meeting at 11. Lauren demands that Phyllis to vote with her. Meanwhile. Ashley and Billy are working together. Victoria doesn’t really want to know what is going on, but it is clear Billy and Phyllis are stuck on opposing sides. Neil is heading out and demands to have a full report on every single HWG expenditure the company has made since he has been gone. Hilary is not happy that Neil is back. Neil visits Victor in the hospital, promising to handle all of Newman’s PR. Neil admits he has a newfound appreciation for everything Victor has accomplished, especially when it comes to family business. Neil has every faith in his kids, but working together is a whole different ballgame. Victor is slowly able to talk more and more. Ashley and Abby go to the GCPD and are furious that Jack hasn’t been released. Paul says the arrest was valid, so they have to wait for due process. Hopefully, Judge Harper will sign off on his release soon. They beg for him to let them sign his proxy but Paul won’t allow it. Meanwhile, at his Jabot office, Kyle is on the phone with Judge Harper, asking him to delay Jack’s release for as long as possible, saying Victor Newman would consider it a great favor. Nikki is upset that Victoria allowed Paul to conduct a search of her house. Vickie tells her mom that Paul found a tablet that looks like Victor’s. Nikki says the rug is hidden in a garage at the ranch and she will take care of it. Victoria wants to ask her dad for help but Nikki says they cannot ask Victor at all because one day he could use this information to blackmail any of the four of them. Nikki reveals to Victoria that Victor knows JT got violent with her and he wants to exact his own revenge. They both feel guilty as Nikki insists she only hit JT to protect her. Victoria says she knows what JT did was wrong, but feels guilty about not seeing the warning signs. Nikki assures her there is no crime in falling in love with a man who’s the father of her child. Phyllis calls Victoria, letting her know that they disposed of the murder weapon and JT’s cell phone. Both women are relieved, but Victoria says Phyllis is very good at this thing and hopes to never cross her. Reed barges in, demanding to know where his father is as he needs to speak to him. Abby and Ashley arrive at the board meeting and worry they might have to reveal that Kyle and Jack are not blood Abbotts. Ashley tells Kyle he is fighting a losing battle. Kyle says Ashley continues to underestimate him as he has it all set to go. Billy exits the elevator with some sage advice. He tells Kyle the only thing worse than teaming up with Victor is thinking you can double cross him. Kyle insists the IPO and Jabot going public was his brainchild, not Victor’s. Billy informs Kyle that he has Traci’s proxy to vote as he sees fit. Reed is angry with Victoria. Her son feels that she told JT to stay away from Reed and not contact him. Nikki orders Reed not to blame his mother for anything and says JT had issues he was unaware of. Nikki tells her grandson that JT was the one who assaulted Victor and the one who turned off his granddad’s ventilator. Reed is shocked as Victoria tells him he may not hear from JT for a long time as he is running from the police. Back at the HWG office, Devon presents Neil with the reports he requested. Neil understands things had to be decided while he was away but now that he is back, he plans to be fully hands-on. Both Lily and Devon are happy to hear it. Neil makes it perfectly clear that he wants nothing to do with the Hilary Hour, even informing her that effective immediately she can work exclusively at her studio, telling her to pack her things and get out. Nikki goes to Crimson Lights to see Sharon, asking for help with the left-overs from their girls night. Sharon is trying to forget last night happened, but Nikki says getting rid of the rug is a two-person job and if she truly wants this to go away, she will do her part and help her. The Jabot board meeting is called to order, Abby is to record the minutes of the emergency meeting. Quickly, the votes are four for going public and four against it. As the 4-4 tie is revealed, Phyllis comes in late and now she has the deciding vote. Billy says Jack gave her a seat on the board for a reason, and Lauren says it’s a seat she wouldn’t have had if Lauren hadn’t hired her. Kyle pressures Phyllis to vote. She looks at Billy and votes for Jabot to go public. Abby says Uncle Jack won’t make it on time to vote. Ashley stands up saying she has information that renders this vote invalid and tells Kyle he will deeply regret taking this action! Neil tells Hilary to check her contract after she says he wasn’t even part of the deal. Neil says she will still be doing her job, but to stay away from his family. Lily tells her to just leave. Hilary tells him that might be hard since the next member of this family could be growing inside her as they speak! Neil is in shock and hopes it was a one night slip up, but Devon says this was planned and they have a contract. Neil says that just makes it worse. Sharon and Nikki return to Crimson Lights, where they have a hot beverage and talk about the unexpected benefits of living on a big ranch. Too bad it wasn’t that easy to get rid of the memories and guilt. Victoria visits her dad, telling him he looks so much better. She sits close to him, talking about how being weak and selfish and her pride and fear of being alone influence her decision. Vickie wishes she could have been stronger and had more courage. Victor has tears streaming down his face, saying it’s not her fault, it was JT. He reminds her to always listen to her mother. She kisses his forehead and hugs him. Kyle calls Ashley’s bluff when she says she has proof that he doesn’t have the authority to take Jabot public. He wants the valid reason. The doors burst open and Jack says, “I heard a vote was being taken!” He is legally free and says the first order of business is withdrawing Kyle’s motion, the vote is null and void. He orders Kyle out of his chair. This last moment of the Wednesday, April 18 Y&R episode means that Jack not being a blood Abbott will stay hidden for now! 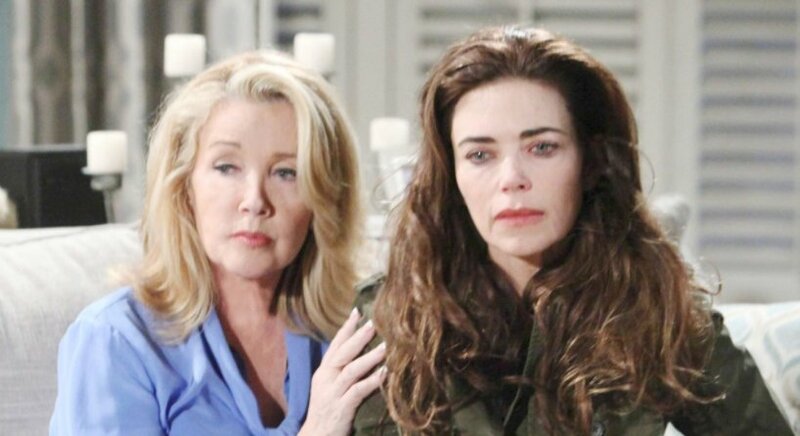 Be sure to catch up on Young and the Restless spoilers for the week of April 16-20 plus news on Beth Maitland’s shocking divorce and the big question of whether Hilary is pregnant with Devon’s baby. 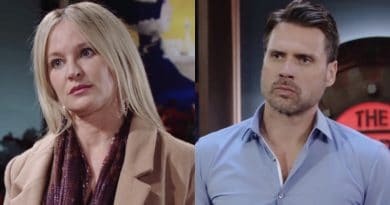 Enjoy this day ahead Y&R recap and come back to Soap Dirt for more The Young and the Restless spoilers and news! ← ‘Days Of Our Lives’ Spoilers: Vivian’s Scheme Against Sonny Blows Up In Her Face!